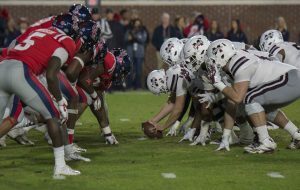 An arduous season came to a close for Ole Miss on Thanksgiving night as the Rebels lost the Golden Egg trophy to Mississippi State after a 35-3 final score. Thursday’s loss marked an end to the collegiate careers of many Rebels including seniors Jordan Ta’amu, DaMarkus Lodge and Ken Webster. Ta’amu was injured during the first half when he dislocated his pinky finger on his throwing hand on a fumble. Although he played the majority of the first half after his injury, Ta’amu was relieved early in the second half by freshman Matt Corral after a third quarter interception. Matt Luke was pleased with Corral’s performance against an elite SEC West defense. Offensive coordinator Phil Longo was also pleased with the play of his freshman quarterback. Although the Bulldogs held a comfortable lead for most of the night, tensions flared after A.J. Brown seemingly scored at the end of the third quarter. Benches cleared, and players on both teams received an unsportsmanlike conduct penalty. Willie Gay, Cameron Dantzler and Jamal Peters (who pulled off the helmet of quarterback Matt Corral in the scuffle) were ejected for Mississippi State, and C.J. Moore was tossed from the Ole Miss sideline. The touchdown was reversed after replay showed that time had expired on the game clock before the snap. Junior tight end Dawson Knox said the Rebels have to play smarter when tensions are as high as they were on Thanksgiving. After another SEC game that saw the Ole Miss offense sputter, Phil Longo claims that a combination of recruiting and fixing issues in coaching and scheme can help the unit move forward. Longo was asked postgame if he plans to be on the Ole Miss sideline next season due to his aspirations to be a head coach. 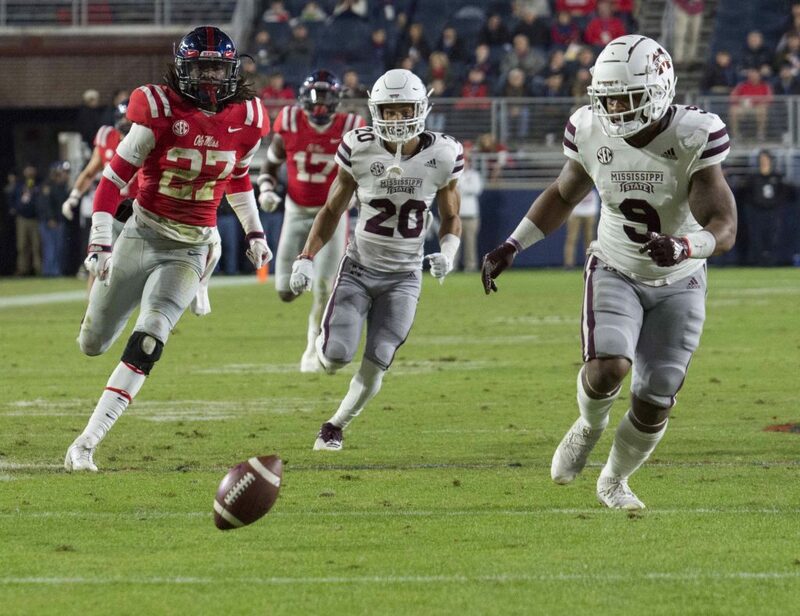 Although the Ole Miss defense forced numerous three-and-outs on Thursday, the Bulldog offense still gashed the unit for 420 total yards, 309 of which came on the ground. Defensive coordinator Wesley McGriff, who was relieved of his duties on Friday, was proud of the effort of his players but claims that the key moments in the game came in the Rebels’ inability to stop the Bulldogs in the red zone. After the Rebels finished the season at 5-7 and 1-7 in SEC play, many fans are calling for changes to be made on the coaching staff. Although McGriff’s fate has already been sealed as of Friday morning, the future for many other names on the staff remains up in the air as the Rebels head into the offseason.